Social and professional communities have now moved to the web and there are new ways to interact. Suddenly every website publisher wants a blog. Whether it's in the structure of a diary, the space for an opinionated director to talk, or a way of unlocking their corporate social responsibility messages, blogs are the seen as the key. They are the simplest form of user generate content and used well they can transform your image and strengthen wider corporate communications objectives. Yet while blogging has washed over the industry like a tidal wave, few blogs truly succeed. The software is only the starting point, and building the right personality and message needs to be part of a wider strategy. 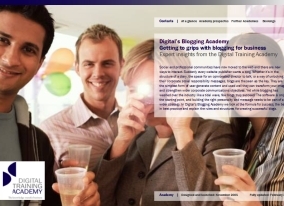 In Digital's Blogging Academy we look at the formula for success, the best in best practice and explain the rules and structures for creating successful blogs.